NEW at Walking Ibiza: Be Mindful Walks bring together the popular practice of Mindfulness with the activity of Walking, creating an enjoyable experience of awareness with a focused mind whilst being in the present moment without judgement and walking in beautiful nature. During the 2,5 hours of Mindful Walking Belinda will also lead you through a variety of guided meditations, moments of silence, elemental and sensory awareness. The health benefits of this combined practice range from stress, pain and anxiety relief through to improved sleep, fitness and better life satisfaction. This is a very interesting and beautiful walk. Belinda will take you from Salinas beach for a lovely beach walk, visit a hidden boat house, find secret coves and enjoy the salt flat area. 5 kms and about 2,5 hours. The walk is on good paths with some loose stones underfoot on parts. How do the walks work? Read on…. You don’t have to make a reservation for our community walks. You just can show up at the meeting point. Good foot wear that has been worn in, trainers are generally ok as long as they have good grip. We have walking poles available to assist you if required. DONATION: The walks are by donation of 10€ per person, the Big Walks are by donation of 15€ per person. It’s important for us that the walks are accessible to all and if you are on a very tight budget then we also accept exchanges like some nice chocolate, something home made or a hug! DOGS: If you have a lovely well trained dog which is also socialized please bring them along. They will need to be on a lead on the roads & some of the beaches . INSURANCE: We have liability insurance, but do not have medical insurance – this is your responsibility. GUIDES: All our guides are trained and have the ability to lead groups, they all carry a first aid kit and use walkie talkies to keep in contact with a back marker to make sure the group stays together and are safe. We also have strict departure and return procedure to ensure everyone is accounted for. The trip and your safety is your responsibility and you must ensure you are covered for this prior to coming on the walk. Beginning in the 21C and travelling back to ancient times to the days of pirates, merchants and salt workers, this promises to be a fascinating and interesting walk full of history. We start by walking along the island’s longest beach of Playa d’en Bossa up to the 18C defense tower perched on the cliff top. Then down to the old merchant’s village, before heading into the forest to arrive at the tiny church of San Fransesc and the modern Interpretation Centre, where we will make time to stop and look inside before walking back beside the historic salt flats to the beach. Sheila’s complimentary homemade cakes, teas and coffee can be enjoyed at the end of the walk. A perfect opportunity to relax and have some fun! Playa d’en Bossa on the beach in front of the back of Ushuaia Hotel. DONATION: The walks are by donation of 10€ per person the BIG WALKS are by donation of 10€ per person. It’s important for us that the walks are accessible to all and if you are on a very tight budget then we also accept exchanges like some nice chocolate, something home made or a hug! This guided walking tour around the city will take you to 6-8 unique places to try different types of food and drinks typical to Ibiza and Spain, including tapas, wine and the famous jamon visiting the local market and much more. We start the tour at 17.00h in the marina of the old town of Ibiza – the centre for business, trading and meeting people for 1000s of years. After we visit a wine shop to taste local wines and liquers from Ibiza we continue the experience with a stop at one of the most special restaurants on Ibiza. 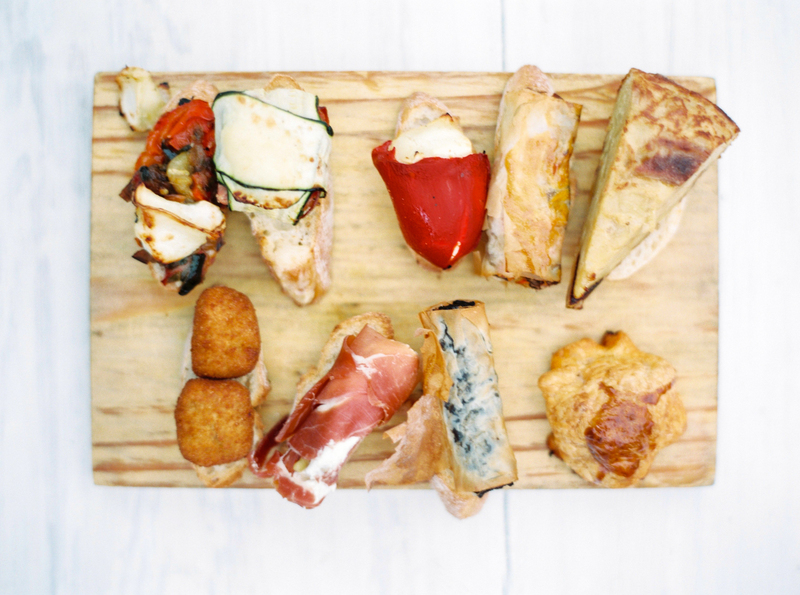 In the ‘living room’ chef Boris, who worked at a famous Michelin starred restaurant, will prepare the most amazing tapas for you with the local and fresh products of that day. 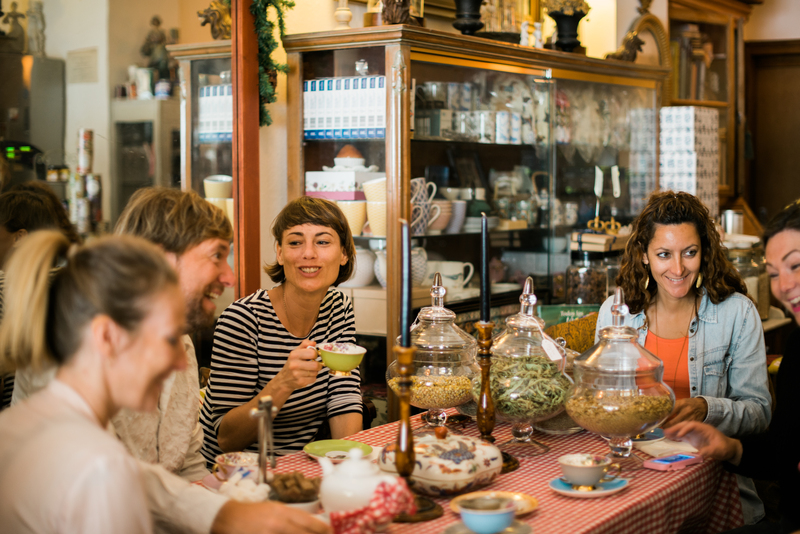 We walk to the oldest bakery on Ibiza and a wonderful tea salon in the enchanting backstreets of Ibiza where we’ll enjoy a delicious infusion of Ibizan herbs along with a traditional sweet pastry. We’ll continue with jamons and cheeses paired with fabulous Rioja wines followed by a busy Spanish bar to taste pinxtos and tapas. We finish the tour with a short walk through the old town to taste locally produced ice cream. The tour lasts between 4-4 ½ hours and costs 79€ per person. It’s the equivalent of having lunch and dinner. The minimum required for a tour to go ahead is 4 from mixed group bookings. To reserve your spot you must book and pay online beforehand through www.ibizafoodtours.com. Private tours can be arranged on request. **** Special Note**** If you are traveling from one of the cruise ships please allow at least ONE hour if you plan to walk, as it is a long way around to the meeting point. Alternatively you may like to use the shuttle bus service or book a taxi. Our guides can only wait for a maximum of 10 minutes if you are late. This new walk is introduced by our guide Tim. He will take you from the restaurant of Puertas del Cielo along a very old goat’s path under a cliff with great views. We then walk to a ruin of a house, through an active spring with running water and small terraces which in the past were watered from the source. We make our way down to the water near some boat houses, across rocks and up through the woods to the biggest and best kept cals oven on the island. This trail was discovered by a family friend of Tim, Bill Moffit, in the late 60’s. He took Tims parents there and ever since he calls it Bill’s Paradise. DONATION: The walks are by donation of 10€ per person the BIG WALKS are by donation of 15€ per person. It’s important for us that the walks are accessible to all and if you are on a very tight budget then we also accept exchanges like some nice chocolate, something home made or a hug! This guided walking tour around the city will take you to 6-8 unique places to try different types of food and drinks typical to Ibiza and Spain, including tapas, wine, the famous jamon, visiting the local market and much more. We start the tour at 10.30h in the marina area where for 1000`s of years it’s been the centre for business and trading. We begin in a traditional bar with local coffee and pastries. We will then walk through the “new town” visiting the oldest bakery on Ibiza, then a tasting of jamons and cheeses, a wonderful tea shop in the backstreets where you will drink a herbal tea infusion created especially for the food tour. We visit the Ibiza food market where you will see locally grown fresh produce and stalls offering traditional meats and cheeses. We finish with a walk through the beautiful old town of Ibiza where you will taste locally made ice cream. The tour lasts between 4 – 4 1/2 hours and you will taste a mixture of sweet and savoury food & drinks, the tour is all inclusive including wine, beer, water, food, tapas and a professional guide. It is the equivalent of eating breakfast and lunch so we recommend not eating before coming on the tour. The tour lasts between 4-4 ½ hours and costs 79€ per person. It’s the equivalent of having breakfast and lunch. Approx. maximum group size is 8 and minimum required for a tour to go ahead is 4 (mixed booking groups). You can reserve your spot through www.ibizafoodtours.com. Private tours can be arranged on request. Our guide Billy is going to lead this spectacular walk in the north where you can find real Ibizan crystals. We leave Portinatx beach and continue along the coast for some crystal gathering, which you can take home with you. From here, we will follow the coastline further, passing secret coves and rock formations. 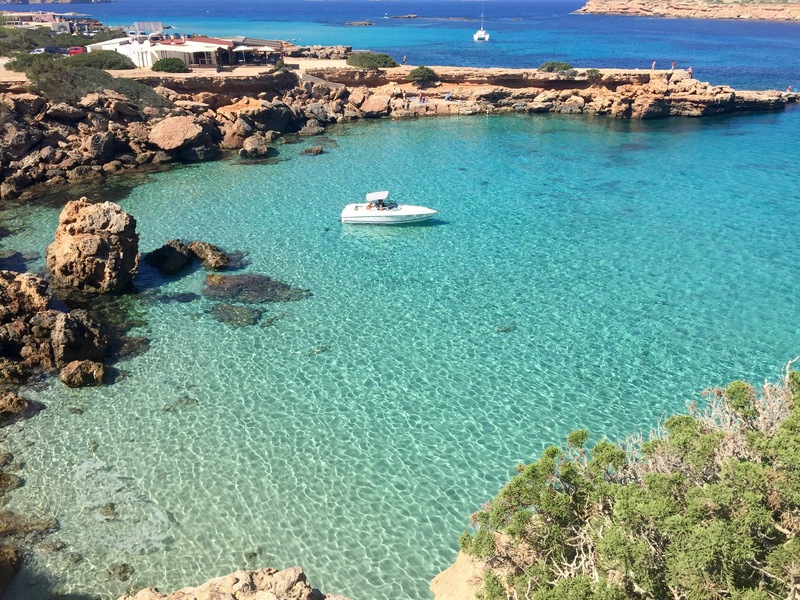 We also pass the island’s most northerly beach where you can find fossils millions of years old as well as experiencing the crystal clear waters of Ibiza. We then cut back through the forest, passing ancient terracing with carob, fig and orange trees, before returning to Portinatx. It’s approximately 10kms with some parts on paths with loose stones and uneven terrain. It should take around three to four hours. NEW at Walking Ibiza: Be Mindful Walks bring together the popular practice of Mindfulness with the activity of Walking, creating an enjoyable experience of awareness with a focused mind whilst being in the present moment without judgement and walking in beautiful nature. During the 2.5 hours of Mindful Walking Belinda M Clarke will also lead you through a variety of guided meditations, moments of silence, mindfulness techniques, elemental and sensory awareness. The health benefits of this combined practice range from stress, pain and anxiety relief through to improved sleep, fitness and better life satisfaction. 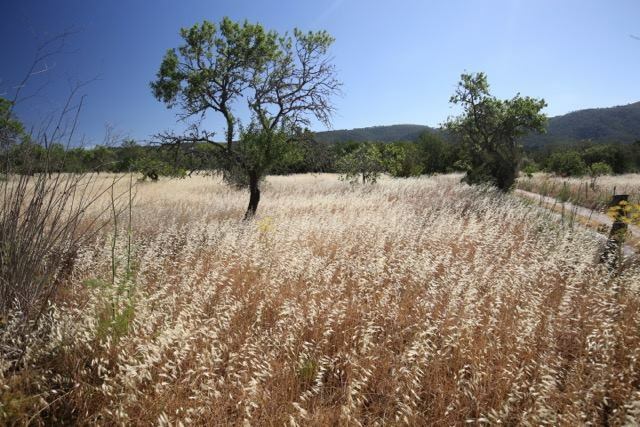 Belinda is leading this walk in the beautiful countryside near Sant Joan, following ancient little pathways and roads, visiting a much loved and ancient well for a spot of barefoot grounding before exploring the many plants and trees abundant in the ibizan countryside. 4kms and about 2.5 hours. The walk is on good paths with some loose stones underfoot on parts. There are some walks which are requested time and time again and this is one of those. Departing from the sleepy village of Santa Agnes, we leave the church behind us and head into the forest following the tracks originally used by men making whitewash, where we can discover some of their old cal (lime) ovens which are still amazingly intact. 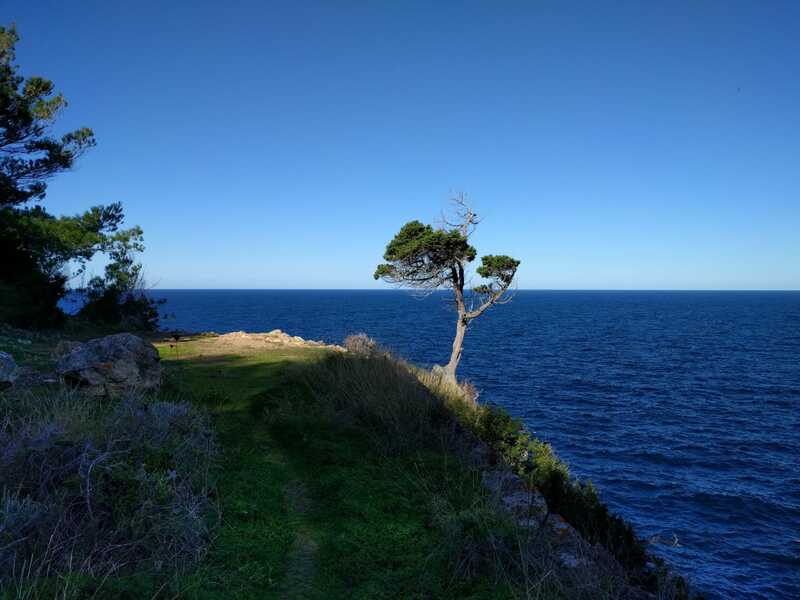 Let’s continue to meander through pine scented forests, foraging for herbs, rosemary, thyme and lavender before emerging on a headland with an incredible view point looking both north and south along the coast. From this 300m high vantage point with the azure blue sea below us, we can see the tip of Es Vedra and on a clear day as far as mainland Spain. Good forest paths with loose stones underfoot. You may have looked up at the scar on the hillside overlooking Cala Llonga and wondered what´s up there? Well, on this walk our guide John will take you up to what remains of a small Bronze Age building and some large Roman ruins. From this incredible vantage point we will have phenomenal island wide views before descending back down into the valley, walking through agricultural land and visit a wonderful secluded beach for a short break and swim. Cala Llonga Beach on the right hand side when looking out to sea. With a good climb to the top for about 30 minutes on good paths but with loose stones underfoot, total distance approx. 10kms. Total walk approx. 4 hours. The tour lasts between 4-4 ½ hours and costs 79€ per person. It’s the equivalent of having breakfast and lunch. The minimum required for a tour to go ahead is 4 from mixed group bookings. To reserve your spot you must book and pay online beforehand through www.ibizafoodtours.com. Private tours can be arranged on request. Tim will lead this NEW Sunday Social Walk which takes us through beautiful hidden valleys of fruit trees with beautiful landscape views. Approx. 10kms and 3 hours. This is a medium walk on good small dirt roads and paths, some with loose stones underfoot. During the 2,5 hours of Mindful Walking Belinda M Clarke will also lead you through a variety of guided meditations, moments of silence, elemental and sensory awareness. The health benefits of this combined practice range from stress, pain and anxiety relief through to improved sleep, fitness and better life satisfaction. This week is all about the element of air, so during the walk the focus will be on breathing and taking in all the fresh Ibiza air. Leaving the Church of this lovely village, we pass by an ancient water well before heading into the forest and enjoying the lovely scent of pine trees, wild rosemary and walking along ancient fisherman’s paths. The reward is to come out high on the wild north cliffs of Ibiza with stunning views out to sea. 5kms and about 2,5 hours. The walk is on good paths with some loose stones underfoot on parts. Sheila will start this walk from Cala Bassa beach, now virtually deserted before the summer madness. 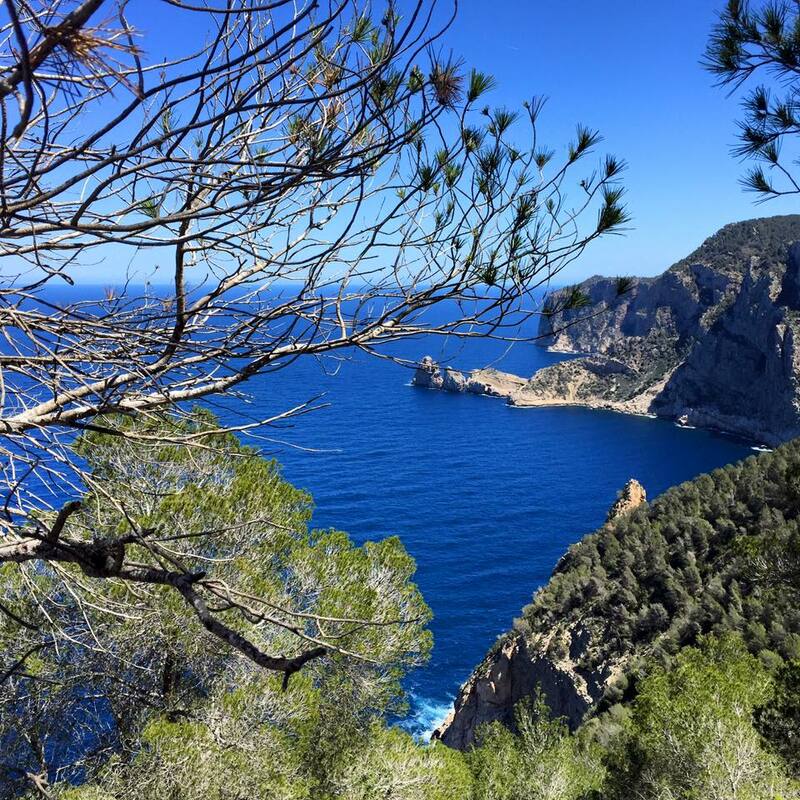 From the forest path the stunning vista opens up to reveal a pirate tower in the distance and an awesome rugged coastline which we walk along as we make our way towards Plages Compte, with superb views of the outlying islands. By contrast we will dive into the lush forest and walk on new tracks to arrive back at the start for Sheila’s homemade cakes, teas and coffee on the beach. Cala Bassa beach on the boardwalk. Free parking behind in the car park in winter. Approx. 6 kms and about 2-3 hours. On good paths and tracks with some uneven terrain in parts. To circumnavigate the island in 4 days by using mountain bikes, kayaks and walking, an incredible Challenge that will test your fitness levels, get your adrenaline flowing and guarantee lots of fun! Including transfers, initiation & briefing, most food – all home made and nutritionally balanced, water, camping and hotels, professional guides for kayaking, mountain biking and walking, celebration dinner and fully supported all the way. Each year the route is different as we have to adapt to the sea conditions for the kayaking sections of the Challenge, so this is the type of route you can expect, but the final route is only decided a few days before. The 4 day adventure begins in the old town of Ibiza – the medieval UNESCO heritage site with its enchanting, winding cobbled streets. 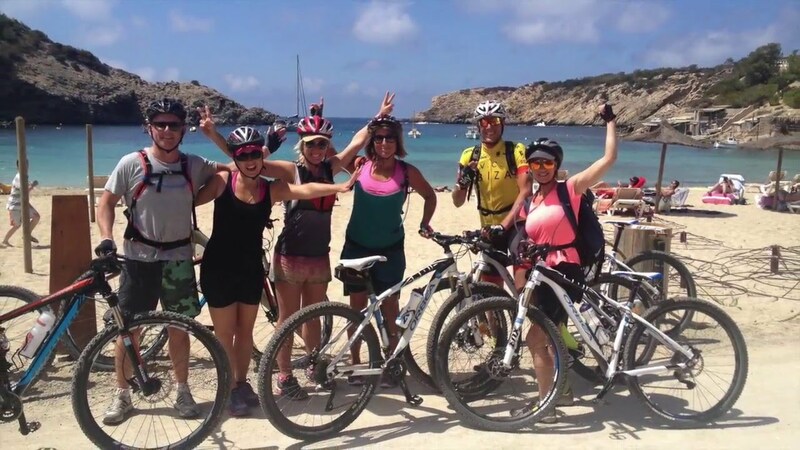 You will be kitted out in the latest top quality mountain bikes and soon be cycling with ease out the old town and passing the stunning scenery of the salt flats of Las Salinas before following the coast with a few stops for a swim and lunch. You will complete 65kms by the time you reach Cala Conta where the kayaks will be waiting for us. It’s then a 10km kayak (approx 3 hours) including the discovery of some wonderful caves before ending up at a secret location where you will spend the night ontop of the 3rd highest mountain on Ibiza at La Montaña, recounting your day’s adventure around the camp fire whilst eating nourishing, homemade food. Waking early to a lovely breakfast, we’ll load up the kayaks with supplies and head off on a gruelling 30km adventure by sea (approx 9 hours). We’ll head up the west coast of Ibiza under the gaze of spectacular 350m cliffs and bays only accessible from the sea. The first place we’ll land will be after about 4 hours kayaking and we’ll take a well-earned rest and enjoy a much needed lunch in a beautiful, secluded `C` shaped bay only accessible by foot and from the sea. After lunch we’ll continue passing amazing vistas and some massive caves, completing the day in the north of Ibiza staying in a lovely hostal where we’ll take well deserved hot showers and dinner will be waiting for us. This day is a wonderful hiking day of 25kms. 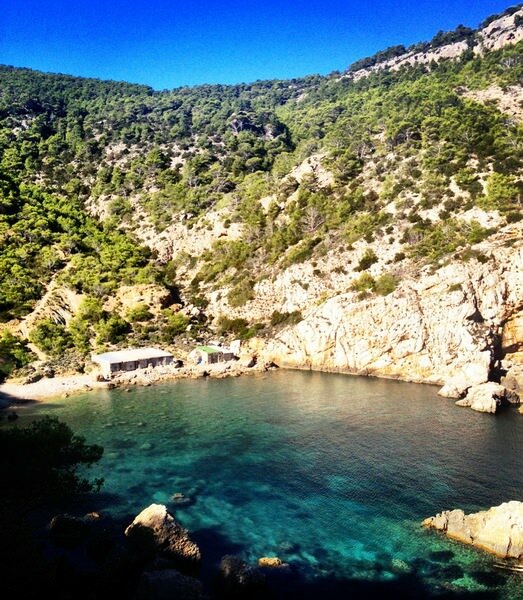 We’ll be hugging the sea around the ‘crystal coast’ where you can find Ibiza’s very own crystals – just the thing to energize yourself – then we’ll continue on, passing ancient terraced farmland and secluded bays (for swimming!) along the way. Lunch will be taken under a rare old oak tree then we’ll keep going, past the most northerly point of Ibiza. At this point we’ll be heading south – and homebound! We’ll spend this night in a lovely hotel on the coast. After filling up with breakfast we’ll get back on our familiar mountain bikes for the 50kms homeward stretch. You will be waved and cheered on by people following your progress online via the live GPS feed – just what you need to spur you on to the end! We’ll pass through some towns today and then head back into the forests with the lovely scent of pine trees all around us. Down ancient lanes, passing incredible modern villas and eventually, with the sight of Ibiza old town coming into view, you’ll know the 4 day challenge is almost complete. A cheering crowd and Champagne corks popping will welcome you at the finishing line! But being Ibiza, the adventure doesn’t end there. Interested? Head over to our booking page to reserve your spot or send an email to toby@walkingibiza.com! As it's Easter we are heading off to explore and find a statue of Christ the Redeemer which is an exact replica of the famous statue in Rio de Janeiro. As it’s Easter we are heading off to explore and find a statue of Christ the Redeemer which is an exact replica of the famous statue in Rio de Janeiro. It’s an impressive 23 meters high overlooking the town of Ibiza from the hilltop. Built in 1947 as a gift from a Bishop who hid in the hills during the civil war. To show the contrast we will also visit Privilege, the largest night club in the world! The walk is on small dirt roads and paths, some parts through fields on un-marked paths. Total distance approx. 12kms. Total walk approx. 4 hours. This walk starts at the church of San Mateu, where we begin our walk in the valleys where most of the grapes are produced for wine on the island. Then Simon will lead you into the forest, enjoying the scented and shady pines, passing olive, fig and carob trees, and foraging for herbs along the way. Then we come to a place where the Moors, in ancient times, built a whole town of 1000 people, surviving off the land and springs which they dug on the valley floor. We will also see the ‘great wall of Ibiza’, which stretches across the headland. Originally 5m tall with look out towers, a small portion still survives. 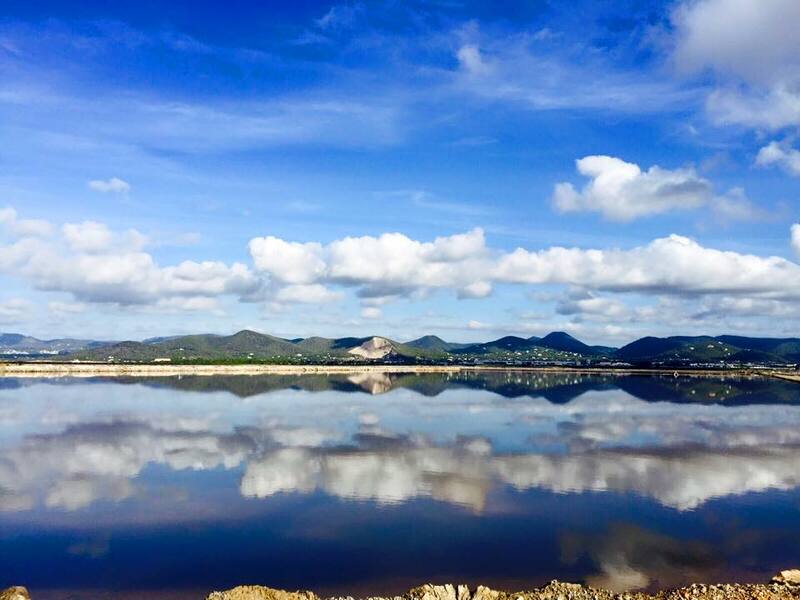 From this vantage point we can enjoy stunning views across the water, as far as mainland Spain on a sunny day! To celebrate the wonderful occasion of Easter, a wonderful Easter themed walk! 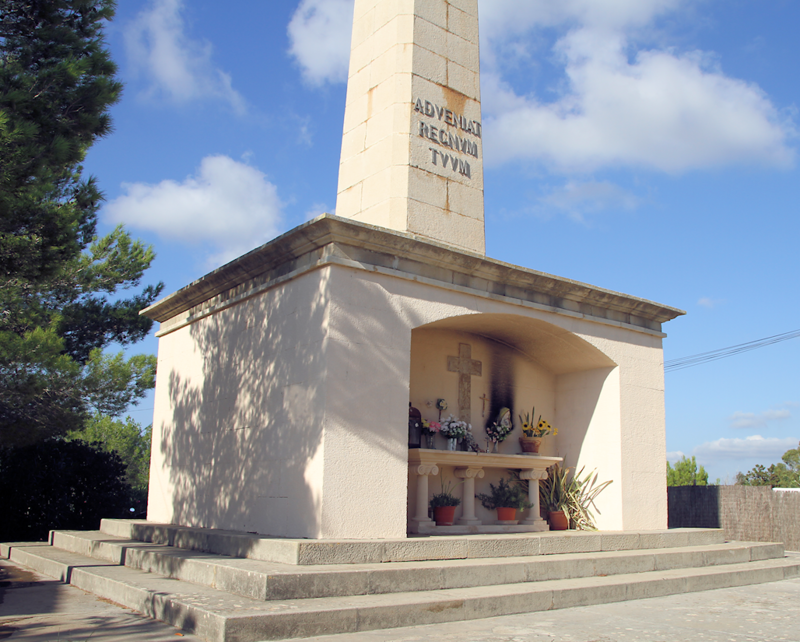 On Easter Sunday 21st April, the founder of Walking Ibiza, Toby, will meet you at San Joan church for this very special walk. From here we drive to the bottom of the 3rd highest mountain to begin the walk from there. We will walk to the top of the mountain and along the way we will look for hidden Easter eggs. 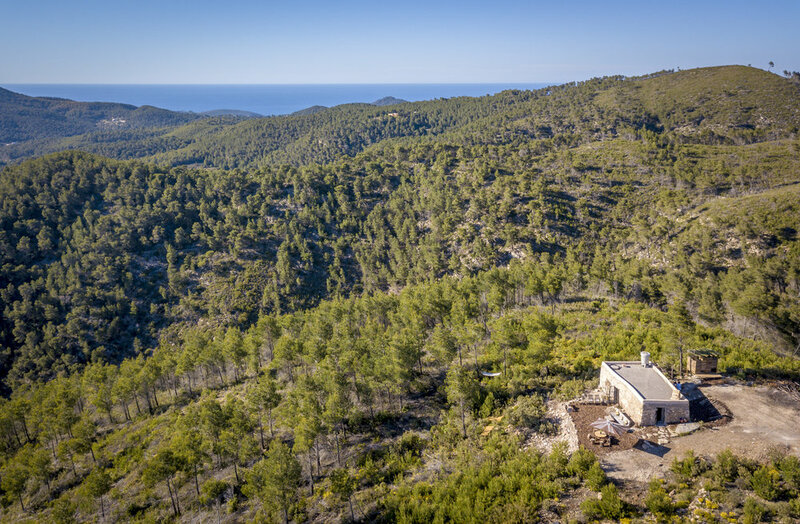 On the top you will find Walking Ibiza’s very own little casita, La Montaña. Here we will have island wide views while enjoying tea, coffee or a cold soft drink. Upon returning to San Joan you can browse the Sunday market. La Montana is a new project of Walking Ibiza. It’s a place where we organise lunches, over night stays, stargazing and walks for members such as walkers, mountain bikers, lovers of the outdoor and people who want to explore and experience the nature of Ibiza. 8kms on good paths with some loose stones underfoot. 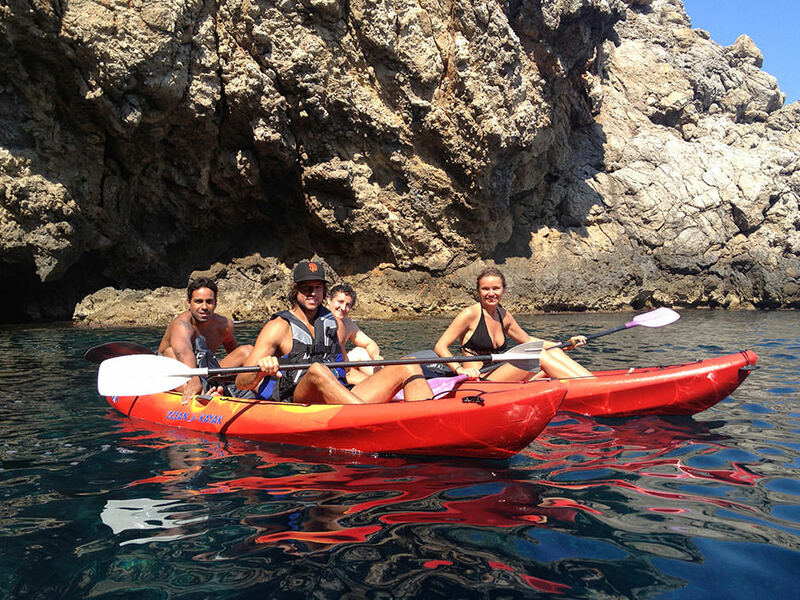 One of the best experiences during Easter is doing a kayak tour in the beautiful north of Ibiza. Kayaking is a really great way to explore the island in a different and fun way. We visit some caves, kayak to the famous Benirras beach and enjoy the view from the water around the rock so named the Finger of God. We leave from the port of San Miguel (the beach) after some instruction heading out on easy to use sit on top double kayaks, you will soon be paddling with ease and having great fun! You must pre- book this tour on our website www.walkingibiza.com as places are limited (€45 per person). We kayak from San Miguel beach to Benirras and back. The full tour will last about 2.5 hours, you must be able to swim and be confident in open water. As little as possible as anything you bring could end up at the bottom of the sea! -We have a small dry bag for car keys & phones. -Wear swimming things and sporty clothes and bring a light jacket as it can be a little cool in April. The area of ‘ Sa Pedrera de Cala d’Hort ‘ is notorious among the locals and those in the know as one of the spiritual cores of Ibiza. 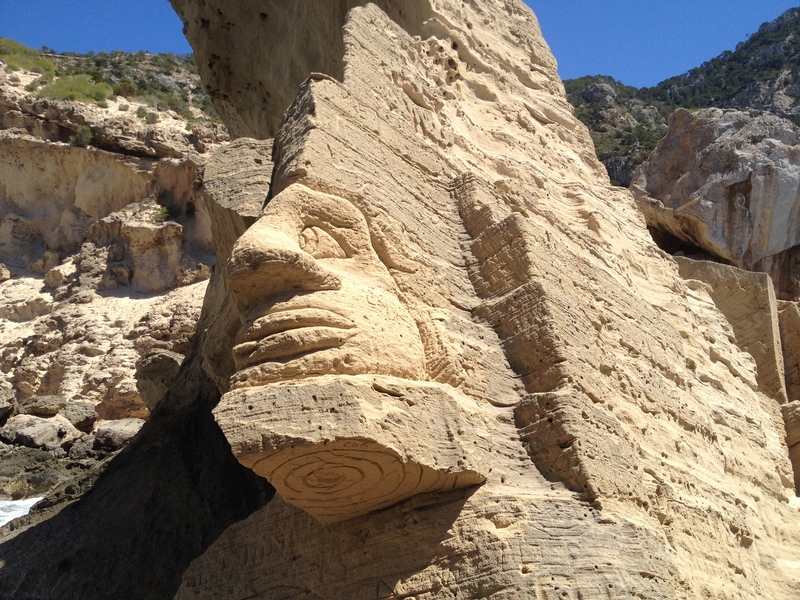 What are the strange carvings and rock formations at this part of the island? Our guide Gato will take you to this magical place. Along the way we pass wonderful paintings left by a Japanese hippy many years ago, energy spirals which we will walk into, caves used still to this day and see some great rock carvings. 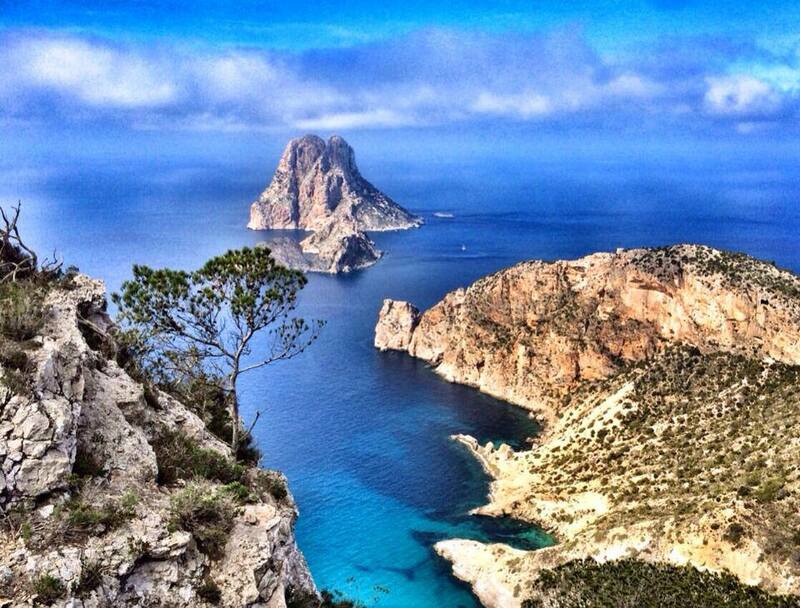 We will also visit the pirate tower ‘ Torre des Savinar ‘ with one of the most famous views of the mystical Es Vedra. Driving from San Josep to Cala d’Hort turn left on the small dirt road at the big Pine tree, with the sign ‘Torre des Savinar” under the tree. Park 50 meters on the left (in the open dirt parking lot). This is not a long walk at only 7 kms but its technical at some points, with steep uphill & downhill slopes and with loose stones. We take it slow and steady. Estimate time 3-4 hours. During the 2.5 hours of Mindful Walking Belinda M Clarke will also lead you through a variety of guided meditations, moments of silence, elemental and sensory awareness. The health benefits of this combined practice range from stress, pain and anxiety relief through to improved sleep, fitness and better life satisfaction. Connecting with Earth as the element to focus on this week, formed from the ashes of fire earth provides for all our needs. Starting in this sleepy village and lovely Church we meander down forgotten lanes passing water wells used for millennia till we find the old hamlet of Balafia and its towers built as protection from invading pirates. The old walls, and towers still stand as a reminder to what Ibiza was once like. 5kms and about 2 hours on good paths, some with loose stones underfoot. We like to do this walk every year in the Spring when the abundance of wild herbs are at their best. A special walk in the countryside near San Joan, where we are going to gather as many herbs as we can find to make our own infusions to drink with homemade cakes, relaxing under the branches of a beautiful old pine tree!! Sheila the wonderful mum of Toby, is leading this walk in nature following ancient pathways. Sheila lives in this area and knows it very well. She will be able to tell you which herbs you can use for your infusions and their many other uses. 5kms and approx 2 hours, plus another ½ hour eating and drinking! The walk is on good paths with some loose stones underfoot and one short main road section. Who is up for THE BIG ONE? Approx. 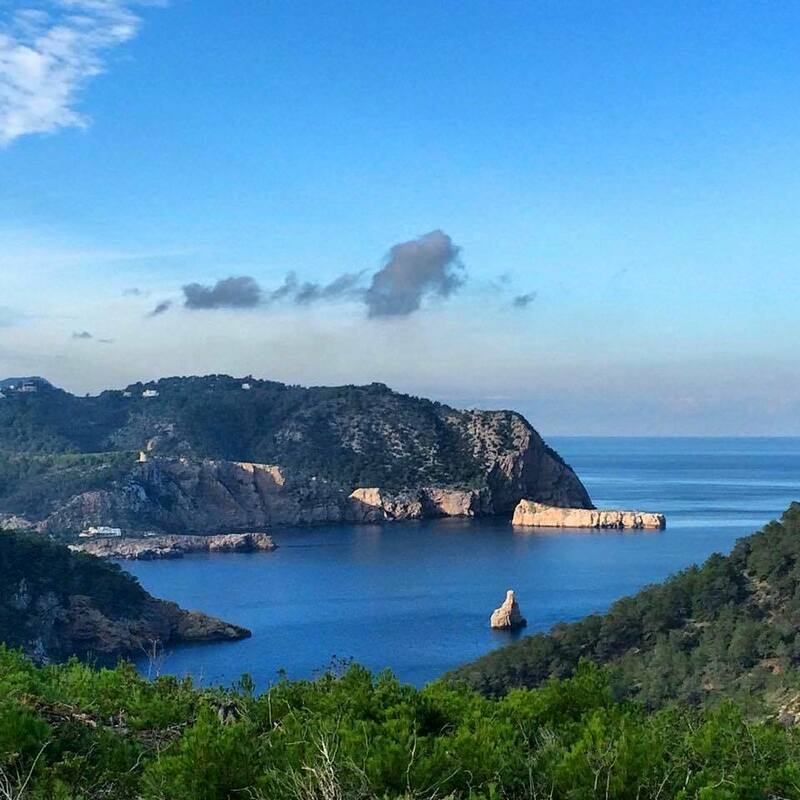 22kms and 6-8 hours depending on the group, 800 meters height climb and some of the most stunning scenery on Ibiza. Starting and ending from Puerto de San Miguel we see it all on this walk, wonderful forests, fields of flowers, lots of foraging, a pirate tower, the stunning Portixol beach for a swim, old fisherman’s paths and great look out locations. This circular walk takes in stunning coastal scenery and wonderful inland forests and fields. Bring plenty of snacks, a good picnic lunch, 3 liters of water, loads of energy and smiles and lets get those legs walking! (we do not pass any shops to buy anything at!). If you have thought about doing the Around The Island Adventure then this is a typical days walking, so come and experience the magic! Ok so I give in, this is the 1st walk rated as Hard! Mainly due to the length and total height climb, and some paths with lose stones on. Total approx 22kms/ 6-8 hours depending on the group and a height climb of 800 meters. DONATION: The Big Walks are by donation of 15€ per person. It’s important for us that the walks are accessible to all and if you are on a very tight budget then we also accept exchanges like some nice chocolate, something home made or a hug! DONATION: The walks are by donation of 10€ per person, the Big Walk are by donation of 15€ per person. It’s important for us that the walks are accessible to all and if you are on a very tight budget then we also accept exchanges like some nice chocolate, something home made or a hug! This walk is always a favorite one talked about for weeks afterwards! It includes in our opinion everything a walk should incorporate: real stunning views, secret beaches, interesting history, a great surprise view, amazing Ibiza villas, old fisherman’s paths and of course lots of magic, oh and a local bar for a cold beer at the end! Our guide Gato will take you on this lovely walk. Lunch is available at the end in the restaurant so please let us know at the meeting point if you would like to reserve a place. The first 20 minutes is on an ancient fishermen’s path and then after a rest a climb up for about 30 minutes on a good camino, some loose stones underfoot. Total walk approx. 12km’s and 4 hours. Water is the focus of the walk this week, water is the source of life and wisdom associated with will power. 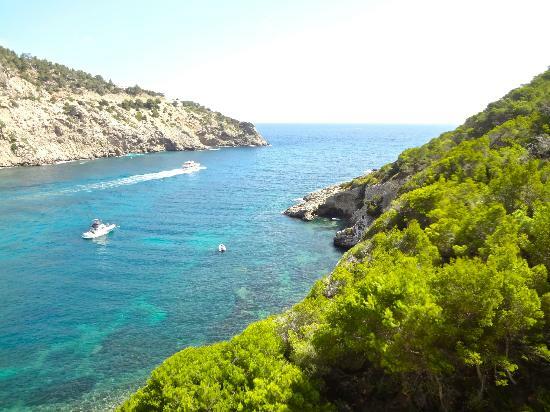 Starting at Cala Tarida we will follow the stunning coastline and along the way you will be able to enjoy looking at the crystal clear water. 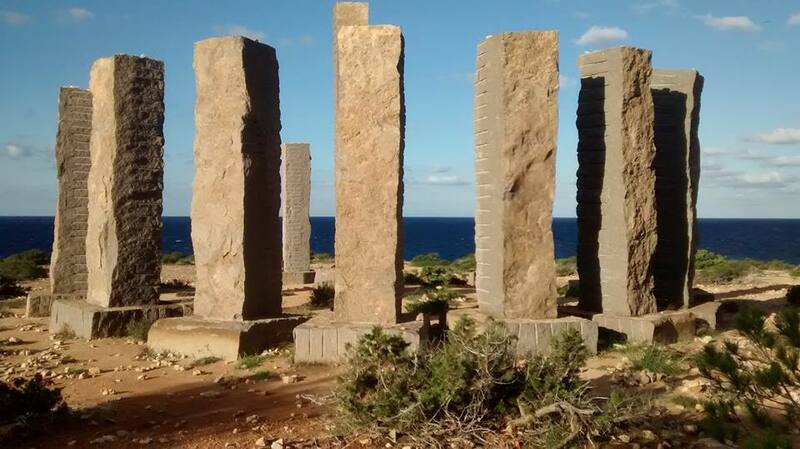 We then find what locals call Ibiza Henge, but what is the purpose, a UFO signalling location, a clock or another use? This week our guide Patrick will take on this special journey. 5kms and about 2,5 hours on good paths. We organise every Tuesday, Wednesday, Friday and Sunday a community walk (in August only on Wednesdays and Fridays). Everybody can join these walks. You don’t have to make a reservation you can just show up at the meeting point. On Wednesdays and Sundays we organise community sunset kayak tours. It’s €45 per person and you have to book in advance through our website to reserve your spot. 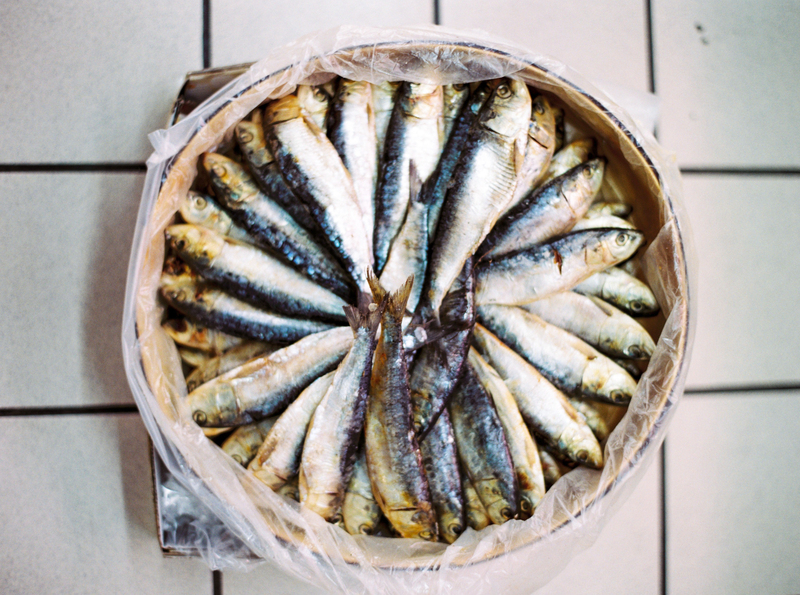 If you want to do something totally different then try our food tours in Ibiza town. A great walking tour through the city trying typical Ibiza and Spanish food and drinks. More info on www.ibizafoodtours.com. We put our monthly calendar on our website and you will find the latest updates of the community walks and kayak tours on our Facebook page. You can also subscribe to our newsletter to get the information in your mail box. Subscribe to the Walking Ibiza mailing list!